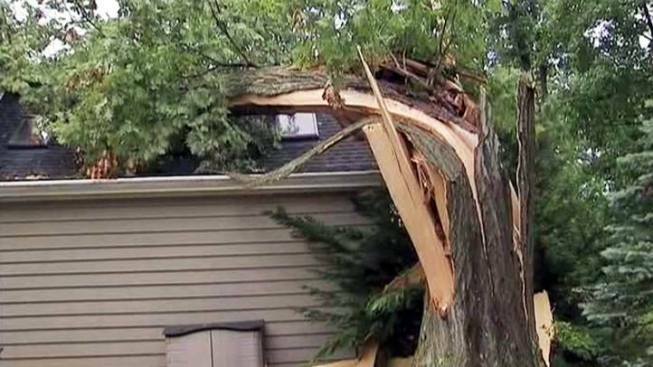 A tornado whirled through New Jersey Monday, the National Weather Service has confirmed, snapping trees and crushing homes in a path of destruction through far western Union County. The National Weather Service said the tornado touched down at 9:17 a.m. in Berkeley Heights near the Passaic River, just west of Garfield Street, moved through New Providence and ultimately lifted at 9:25 a.m. in Summit, near Evergreen Avenue. At it widest point, the EF-0 tornado measured 50 yards wide and traveled about 4.8 miles, according to meteorologists. While relatively small, it was devastating, carrying winds of up to 85 miles per hour. One resident in Summit had just stepped into his kitchen to make breakfast when a tree came crashing through his newly built great room. 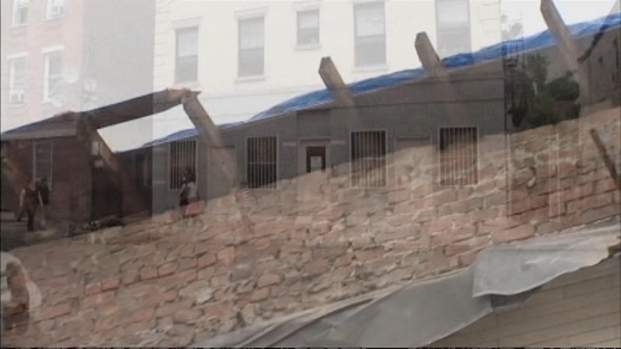 New surveillance video shows just how powerful Monday's storm was as it moved through Yonkers. Pei-Sze Cheng reports. "I have never seen wind like that, the trees around, shaking like that," said Girgis Shehata. "It's a miracle to me that I was in the kitchen." Wayne Bergman of Berkeley Heights recalled the moment the skies got "pitch black" before a tree topped over into his backyard. "My wife says, 'It's raining sideways,'" he said. Monday's storms caused seriously flooding in parts of New Jersey, like Fair Lawn, where a bus was nearly swallowed by water with people still inside. Tracie Strahan reports. "All of a sudden, you heard this big bang. And that's when the tree came down and the fence exploded." A wooden fence, a metal fence and a vinyl fence that had been in his backyard for 20 years were each knocked down. The National Weather Service said there was extensive tree damage along the tornado path, with the greatest destruction at a sewage treatment plant near Snyder Avenue in Berkeley Heights. The National Weather Service is in Berkeley Heights, N.J. collecting data to confirm whether or not a tornado touched down in the area. Brian Thompson reports. A tornado was also confirmed in Connecticut, in the area of Windsor Locks and East Windsor in Hartford County. It brought down power lines, peeled the siding off of homes and yanked a sports indoor dome out of the ground during summer camp there, NBC Connecticut reported. NJ Transit service on the Morris & Essex lines was suspended for part of the morning from Dover to Summit in both directions because of downed trees and other weather-related conditions. It was later restored, with delays. 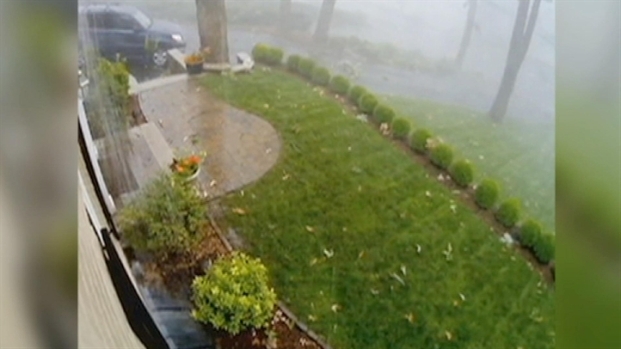 A viewer in Summit, N.J., sent in video from a home surveillance camera that shows wild weather outside. 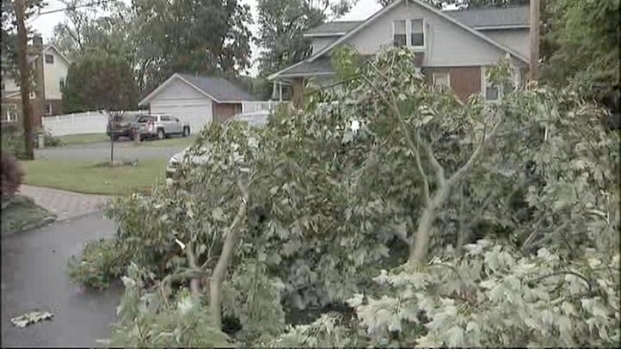 The National Weather Service was investigating whether a tornado touched down. 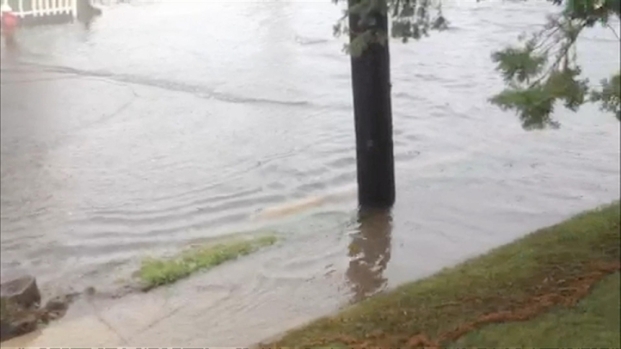 Storms also tossed trees and dumped heavy rains on other parts of the tri-state Monday. Police in Yonkers, N.Y., said an estimated 50 trees were down on Riverdale Avenue, and numerous trees hit power lines in the Nodine Hill area. Con Edison crews were on scene to restore power to several hundred customers who lost it. "The trees started falling ... it was terrible," said Garnet Boyd. "You couldn't see anything." See video of flooding in Carlstadt, N.J.
High winds tore off the roof of an apartment building on Willow Street, then flung it across the street where it knocked out wires, an air conditioning unit and windows before crashing into the upper floor of a building on the other side. "The wires came down, so it was like flames going off. We saw wires on the floor, the ceiling was halfway cracking," said Jamileth Hernandez, who lived in the exposed building. The family was ordered to stay inside until rescue crews managed to clear what was left of the roof. The National Weather Service said cars were stranded in floodwaters in some parts of Westchester County. The agency is investigating whether a microburst caused the damage in that area. --Brian Thompson, Andrew Siff, Marc Santia and Pei-Sze Cheng contributed to this story.